Today, I saw Steve, my office-mate, for the first time in a couple of weeks. I’ve been out of the office a lot because of TA-ing this semester, and we just weren’t in the office at the same time. He looked at me, and said that I had the same too-lazy-to-shave facial hair as he did. He was amazed that I hadn’t shaved for 3 weeks; he already had a more pronounced beard after only 2 days! 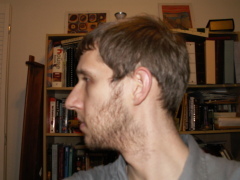 Admittedly, his facial hair wasn’t as long, but it was darker and fuller, resulting in a better beard. look. At least I ventured out of my “comfort zone” for a little while. In order to be a UC Berkeley teaching assistant, I need to sign the following loyalty oath. It seems like some sort of horrible holdover from the McCarthy era. WTF?